My very last post of 2008. Someone very special to me bought me a box of very very nice chocolate. Heart u so much ! 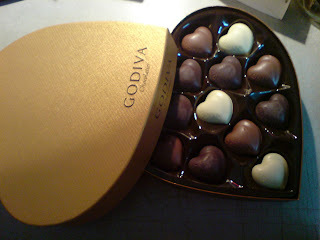 GODIVA, one of my favourite chocolate choice..if anyone of u are nice enuf to get me a box of GODIVA PLATINUM CHOCOLATE BOX for my coming burfday, i m so goin to melt in front of u.....haha..
Mum, thank u so much for going thru the hard times with me. Hear me crying so badly on the phone.Talking to u everyday comforts me so much. Thank u for all the presents i get this year. Especially the COACH handbag. I love it so much and will alwiz appreciate it coz i know u never belive in splurging so much for just a handbag but u bought it for me.I had an awesome weekend last week.Only both of us, shopping, eating and like alwiz u listen to me crap, make silly jokes and gossip......and i love skincare shopping with u...I LOVE U ! I guess i will start blogging again after new year, till then HAVE A MERRY CHRISTMAS 2008 and HAPPY NEW YEAR 2009.